The search for a better life has torn families apart; mothers and children separated from the menfolk ending up in Nauru while the men sent to Manus Island, Papua New Guinea. A refugee from Kabul in Afghanistan who refused to be named said their search for freedom got them locked up in what it feels like a prison, a torture centre for 5 years now. The refugee said the process for their resettlement is taking forever and the International Organisation for Migration is not fast tracking the resettlement plan and they do not know how long they will be at the processing camps. “I came here when I was 17 years old, now I am 23 and I have not settled anywhere yet”, he said. He further explained that he left high school at the time he ran away from home because of the Taliban and the suicide bombings in search of a better life. Most refugees still here in the country are saddened that even though the PNG Government confirmed the PNG resettlement policy in 2015, where by the Australian Government will provide funding and logical support to PNG to assist resettlement of the refugees in PNG or transfer them to other third party countries to settle, only 102 refugees have left the shores of PNG and have settled in the US out of 1200 refugees who came to Manus Island. He claims 500 more refugees are still waiting to be resettled, the remaining non-refugees are also still waiting for deportation to their country of origin. 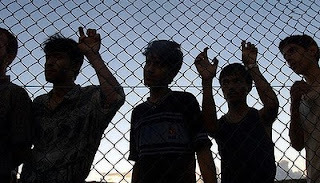 The Afghanistan refugee said from the detention centre to the processing centres in East Lorengau, West Lorengau and the Hill Side centre, a total of seven (7) men have died with the latest death of a refugee only two months ago. “How many more will end up killing themselves in the process of waiting?” he questioned. “We came as refugees seeking a better life but we feel like we are tortured inside a prison camp,” he said. When asked if settling in PNG would be an option for any refugee, the refugee replied, “None of the refugee will consider settling in PNG because PNG is still not fit to settle refugees in the country”. “The Papua New Guinea Government cannot provide housing for it citizens nor can it provide job opportunities,people are still struggling and the living standards are very low”, said the refugee.